Since references to WWW-sites are not yet acknowledged as citations, please mention den Dunnen JT and Antonarakis SE (2000). Hum.Mutat. 15: 7-12 when referring to these pages. 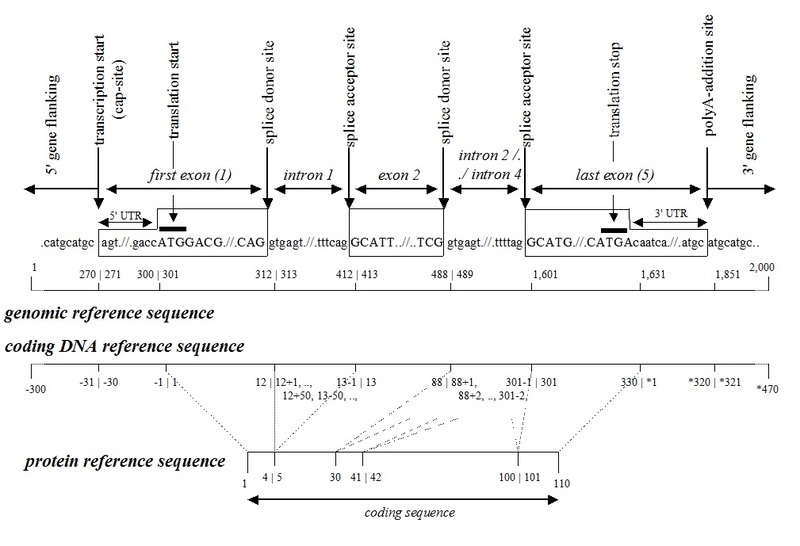 For a coding DNA reference sequence the basic recommendation is that it should represent the major and largest transcript of the gene. Alternatively spliced exons (5'-first, internal or 3'-terminal) derived from within the gene can be numbered as for intronic sequences. Variants in transcripts initiating or terminating outside this region can be described as upstream / downstream sequences.